Striped cucumber beetles have made their annual debut in the Annapolis Valley. These pests are problematic in many ways. Feeding damage can stunt plants, and when flowers are predated, it can reduce fruit set and yield. Cucumber beetles also vector bacterial wilt. Scarring on fruit by adult beetles reduce the marketability of the crop. Newly emerging cucurbit plants are particularly susceptible to stunting and bacterial wilt, while older plants can withstand up to 25% defoliation. Early season control is essential with this pest, and it is important to scout your fields regularly. 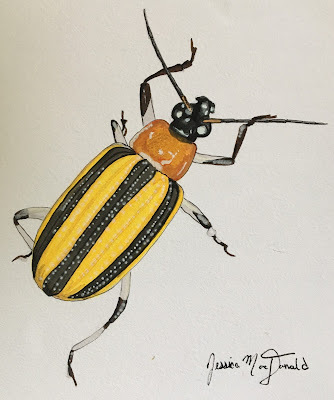 For more information on cucumber beetle biology, beneficial insects, and organic management, check out Managing Cucumber Beetles in Organic Farming Systems on eXtension. Please click here for Perennia's Pest Management Guides for Cucumbers and for Melons. For Perennia's Pest Management Guides for Pumpkin and Squash, please click here. Insect netting can also be an effective control option for this pest, but netting must be removed at flowering for pollination to occur.